A good projector can truly elevate your home cinema setup, but installing a wired projector and accompanying speaker system can be time consuming, not to mention pricey. If you're keen on giant-screen action, but you don't want the associated hassle, it may be worth looking into portable projectors – and the latest model from XGIMI, the MoGo Pro, could be a great option based on its promising specs and travel-friendly design. The MoGo Pro is currently in its "prototype stage," with a goal to raise $50,000 via a crowdfunding campaign – although backers can preorder the projector. The inbuilt battery can also handle five hours of music playback. 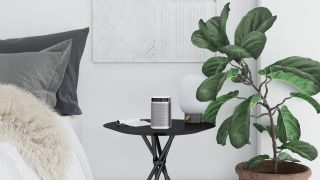 Despite its small stature, the MoGo Pro promises a big sound, thanks to two 32mm 3W speakers created by Harman Kardon, which XGIMI says will deliver "True 360 sound" – although it's hard to say how effective this is without testing the projector. In terms of resolution, the MoGo Pro throws out a 1080p HD image "up to 76 inches" from 2 meters away, with a brightness of 250 Lumens. Perhaps the most interesting thing about the MoGo Pro is that it features all the capabilities of AndroidTV 9.0, which means the projector comes with an enormous library of movies, TV shows, music, and games built in. With that Android TV functionality, you also get all the smarts of Google Assistant, which means you can navigate that library with your voice. All that tech does come at a price; the MoGo Pro will retail for $599 (£629 / around AU$1100) when it becomes available to buy – XGIMI says that delivery is expected to commence in October 2019. That being said, backers of the IndieGoGo funding campaign will be able to preorder the MoGoPro for the "super early bird price" of $349, which works out at around £263 / AU$490 based on current conversion rates . This is quite reasonable for a high-spec portable projector, and cheaper than the highly-rated Anker Nebula Mars II portable projector – but only if you get the early bird deal, of course.